Most sentient beings in the known galaxy live on planets, moons or in direct orbit of such. However, very few planets and moons are naturally habitable for its whoever intends to settle them, and many are either impossible or infeasable to terraform given the technology and resources available. Even if they are, all but the most high-tech, work and resource-intensive terraforming projects on near-habitable worlds take from a few decades to a few centuries to complete. In either case, if there is a need or want to settle on a world wich cannot be terraformed or is still being terraformed, one will need to maintain habitable biospheres on a more limited scale. 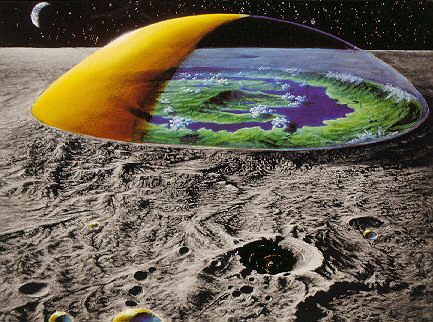 Crater habs are a low-cost and low-tech solution to the need for permanently inhabited settlements on the surface of uninhabitable worlds. A crater is selected based on size and proximity to desirable and undesirable features such as resources or volcanoes, it is then covered with a dome equal in size to the crater. The space underneath the dome is made airtight and pressurized. Biosphere engineers then ensure a habitable, self-sustaining environment within the habitat, and a settlement is constructed on and below the crater surface. It is common for the surface area to be reserved for food production and secondary life support functions while most of the heavy industry and infrastructure is placed underground. Depending on the levels of sunlight and radiation, the dome may be treated to protect against either or both, or artificial lighting may be required.